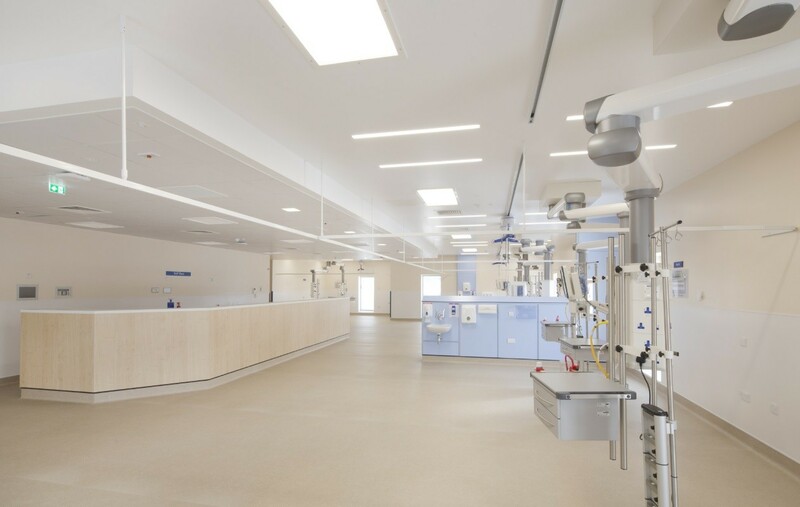 Graham Construction has completed work on an Oberlanders designed £5.5m critical care unit at Monklands Hospital, Airdrie, on behalf of NHS Lanarkshire. The 10-bed unit is one of 12 phases planned by the hospital for delivery by spring 2018 as part of a £19m refurbishment of its theatre areas. Dr Jim Ruddy, consultant in intensive care medicine and anaesthesia, said: “For many years, the critical care unit and theatres have provided excellence in all aspects of care to our local community in Lanarkshire. Work will now move onto the former critical care unit, which will be remodelled to form a recovery area alongside refurbishment of seven existing operating theatres. 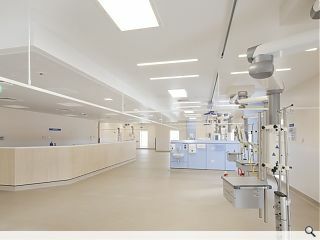 Owing to a photography mix-up comments 1-9 refer to a previously pictured pathology building as opposed to the refurbished ICU building referred to in the article. This has now been corrected. Loving the way the keyclamp edge protection has been sensitively integrated into the elevation. Remarkably, and almost unbelievably, this is even more brutal (and I don't mean that in an admirable expressive concrete sort of way) than the initial renders. It looks like it was almost finished and someone from the 'elf and safety team in the hospital estates department rocked up and queried the edge protection...much scurrying around and searching of drawings would have, no doubt, revealed a tiny note on the construction drawings transferring the responsibility for edge protection to the contractor and from them it would have rolled serenely downhill (the way jobbies do)and onto their subcontractor. A few aggressive email exchanges and tense meetings on site will have led to the subby needing to find the cheapest, fastest solution....and that ladies in gentlemen is what we are now presented with. On the plus side it looks like that little grass strip below the ramp will really soften and humanise the entrance, nice touch. I think comparing a clinical environment with what is effectively a domestic project with very differing requirements is very similar to comparing a goldfish with a squirrel. ...more like a WWII coastal defence installation than a clinical 'environment' I'd have thought. Monklands too, oddly enough, is also a labyrinth of tunnels. What I’m trying to say is that if I was unfortunate enough to require critical care surgery I wouldn’t be lying there in theatre waiting for the surgeon and thinking to myself “oooh I wish the building was a bit more pretty on the outside” or for that matter wondering how may architectural awards its won. Oh well then that's that. Let's just not bother then. Glad that's been cleared up. Now where's my cereal? @Thatcherite - well yes and no. Sure when you are inside the critical care unit the quality of the care is the most important thing. But the surgeon you are lying there waiting for has to go to work in that place day in day out. Surely, we still believe that architecture has the power, and indeed the responsibility, to make a positive contribution to the urban realm and that well designed buildings and public space can have a positive effect on the spirits and the soul. Now we return to your surgeon and the clinical team walking into that environment every single day. The building suggests, at least to me, that the bare minimum is acceptable. If that rubs off on the surgical team then we are all in trouble. I wouldn’t disagree with your thoughts. I suspect the budget for the project will have dictated the outcome with functionality top trumping aesthetics. Which makes me wonder who is then the root cause of the issue. The current Scottish Government for not providing enough funding to the NHS for aesthetics ? Or are we all at fault for not wanting to pay more tax to pay for better aesthetics ? Can we have the pic of the Pathology Dept back please? The edge protection discussion is surely much more interesting and relevant to the "Urban Realm" than this bland as can be interior design refurb fit out. Speaking from experience, the people who work in these facilities take their Joy from the lives they save. #14 I also wouldn't be concerned about architectural gymnastics in one of these facilities. In fact I'd be annoyed to see it. Which is why I'm questioning the relevance of this deliberately rather bland functional interior fit out news story in an architecture web site. Has anyone learned anything from the article? @15 - fair point. Except I wasn't suggesting that the building and architecture more widely was there to replace that joy. I said, and I thought I was quite clear but perhaps not, that the urban realm should and can make a positive contribution to peoples outlook and general mood; in my original terms their 'spirit and the soul'. I'd certainly agree that the 'functional' argument of medical procedures is vitally important and i'm very pleased to hear that your experience on that side reinforces the notion that this is where the clinical teams core interest lies. However, the architects don't carry out clinical procedures as it's not really our bag. So we need to concentrate to getting right the parts that we have some semblance of control over right. The treatment of edge protection is one such area. In the initial photograph presented in the article there was a lack of, in my opinion, consideration given to said edge protection with eth result being a clumsy keyclamp handrail running around the building. It looked heavy, ugly and as though it was an after thought. That can be the end of the story or not...I'm not a big fan of those sort 'end of story' types statements, they seem designed to stifle debate and critical enquiry.